Gary Mulhall, aged 4, from Lake Munmorah in NSW, already has funding for his wheelchair but his family approached the John MacLean Foundation for funds to purchase something to help him sleep more safely in his bed at home. Gary lives with his parents and younger sibling and is reliant on his family for all his care support needs. He has had refractory epilepsy since infancy and cerebral palsy. 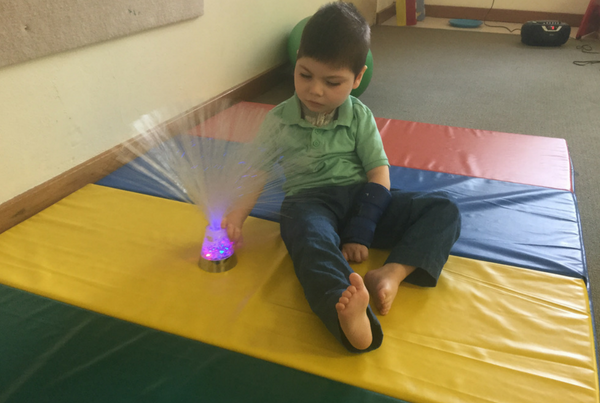 He presents with a visual impairment, limited control over movement in the left side of his body, difficulty communicating his needs and he experiences multiple seizures on a daily basis. JMF has been able to help with the purchase of a Dinobumper (whole bed bumper) for Gary which allows him to be safe during rest and sleep in his bed. While Gary enjoys being tickled, exploring his environment and watching his favourite movies, he has frequent seizures during which he falls to the floor and is often unresponsive. One of the contributing factors to Gary’s seizures is build-up of fluid in his brain which is managed by a shunt. Any bumps to his head risk affecting his shunt and contributing to his seizure activity which can be life-threatening. Gary is at high risk of bumping his head through falls during play or when a seizure occurs and requires constant close supervision throughout his waking hours to ensure his safety. His family have modified his play areas to provide cushioning to prevent against injury during these drop seizures however Gary’s bed has wooden cot sides and he was constantly at risk of hitting his head on the bed rails and so could not be left alone while he is in his bed. As a result, Gary’s parents had to sleep beside his bed in the same room so that as soon as he woke they could monitor him and either assist him to settle or remove him from the bed to stop him injuring himself. Padded bed rails was the answer and would enable Gary to be safe in his bed and reduce both Gary and his family’s anxiety when he is resting or sleeping in his bed, wakes during the night and is not being closely supervised. But not any old padded rails would do as they needed to fit properly and be secure enough to stop Gary getting stuck in any gaps. Gary’s Dino electric cot bed could be retrofitted with safely padded bed sides, known as a Dinobumper, so after a successful trial at home of this new accessory, the family (with the help of his Occupational Therapist) applied for and received a contribution towards the purchase of a Dinobumper for Gary’s bed. Currently no statutory funding is available for this product, so together with a generous contribution of $500 from Gary’s grandparents, JMF was able to donate the remainder to fund the $3.5K accessory.